Lt. Gen. Keith Alexander talks to Baltimore Council on Foreign Affairs. What is the “national security justification” for eavesdropping on our European allies? the former ambassador asked the head of the National Security Agency. 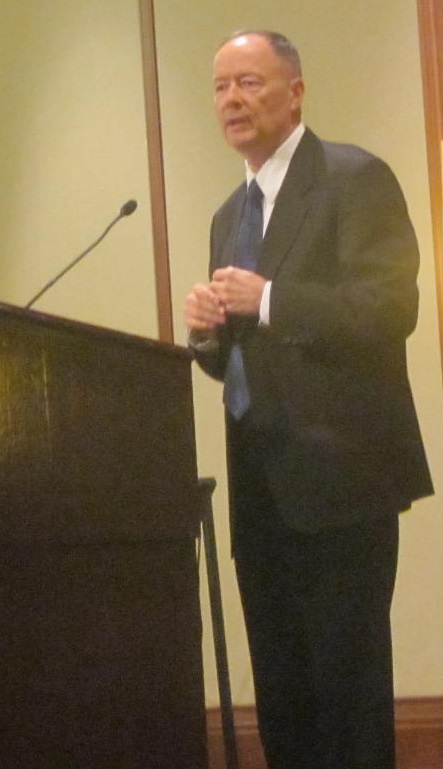 The setting was not a congressional hearing, as it was earlier this week, but a Hyatt Regency ballroom in downtown Baltimore Thursday night where the Baltimore Council on Foreign Affairs was hosting a talk by Lt. Gen. Keith Alexander, head of the nation’s electronic spy agency headquartered at Fort Meade. Ambassador Jim Rosapepe, the former U.S. envoy to Romania aka the state senator from College Park, was one of a dozen unscreened questioners who got to ask Alexander about once-secret electronic spying on foreign leaders and other issues. Alexander told Rosapepe and the audience of more than 500 that the justification for listening to the phone conversations of leaders of Germany, France and other U.S. allies came from the tasks the spy organization was given by civilian authorities. Deadly terrorist attacks are on the rise overseas in Asia and Africa, with more people killed this year than last, he said. “We know they want to kill Americans,” Alexander said. 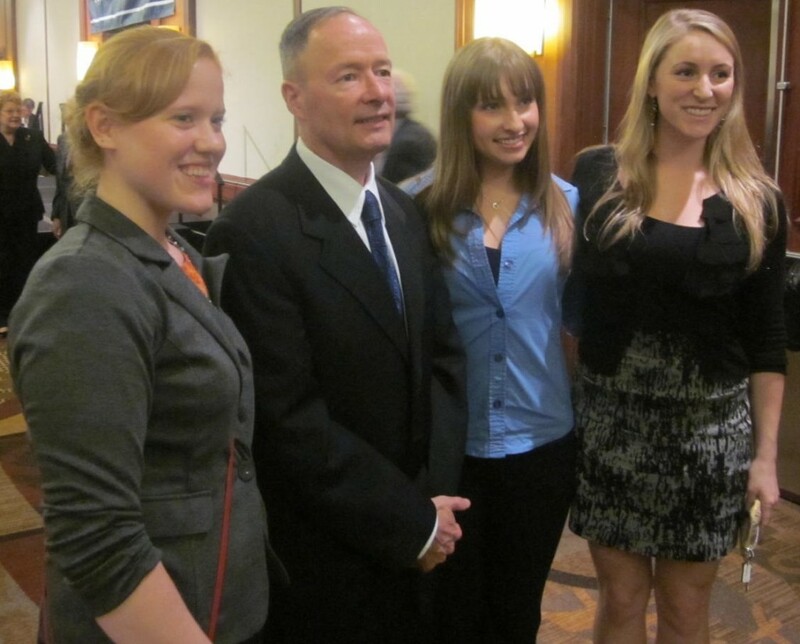 But NSA snooping in cooperation with Homeland Security and the FBI has been able to prevent that by connecting the phone numbers of foreign terrorists with numbers in the U.S.
Gen. Keith Alexander posed with international studies majors from Towson University. From left: senior Melissa Stoker; junior Cassandra Harris, with a minor in Arabic; junior Lauren Parrinello, also ROTC. Stoker holds the Catherine Curran O’Malley scholarship in international studies, named in honor of Maryland’s first lady who graduated from Towson with that major. In his once behind-the-scenes role, Alexander has been in the public hot seat for months over leaks of classified information by former contractor Edward Snowden, who fled to Hong Kong and then Moscow. Alexander described in detail the procedures and limitations on access to U.S. phone records that have been collected in a “lockbox” — only the phone numbers, the time and the length of the call, no personal data or conversations. This has allowed NSA to “connect the dots” on terrorist plots, such as the foiled plans to bomb the New York subway system. He decried the leaks of NSA programs and what he described as erroneous and destructive media accounts. Alexander was disdainful of a Washington Post report Wednesday about NSA tapping into the networks of Google and Yahoo. 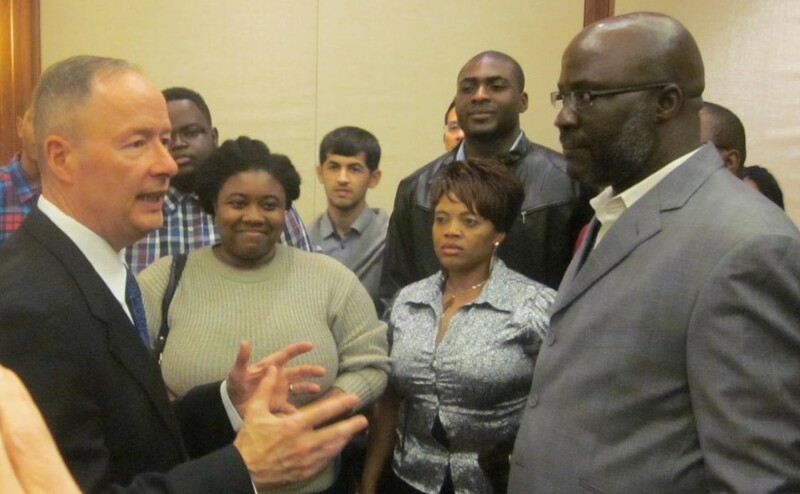 After his talk, Lt. Gen. Keith Alexander spoke to Baltimore City Community College students and staff. The general was dressed down in a civilian suit and delivered his remarks in his usual homey style that makes him sound like the 61-year-old grandfather he is — he has four daughters and 16 grandchildren that he typically mentions in speeches to Maryland audiences. But there is no question of the steel behind the soft and often jocular manner of this West Point grad who has four master’s degrees. “What is that war on terrorism all about? Why do they hate us so much?” asked his first questioner.